Customer feedback integrated with Dream & Harmony for Epsilon customers. Together we serve great brands like TWC, Container Stores and Ben & Jerry's. Sensorpro is the technology behind ShoppersVoice, a service from Epsilon Targeting. The Sensorpro platform is fully integrated with Epsilon email products and resides in the Epsilon secure technology data-centers in Europe (Dublin) and US (Texas). Integrated with Dream and the new Harmony API. Epsilon customers typically deploy Sensorpro for traditional surveys, NPS and Forms with robust email integration. Sensorpro is listed in the Tungsten system & can be ordered directly from your Epsilon Account manager. 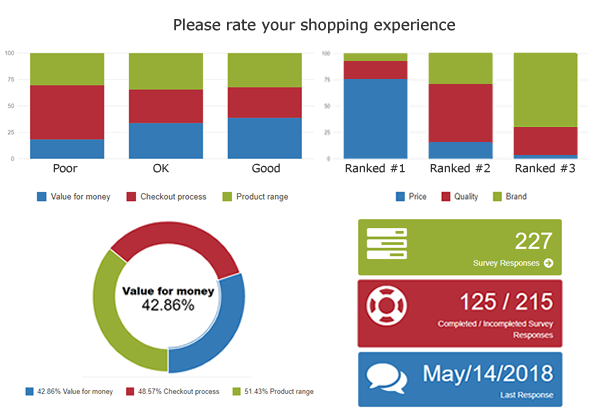 Survey templates like Net Promoter Score (NPS), Customer support & Email polls. Drag & Drop survey designer. 25+ Question types with responsive options. Theme selector with configurable styles. Text piping & Answer filtering. Skip logic, Question branching & Randomize answers. Text sentiment analysis & tag cloud. Export survey results as PDF. REST API endpoints to act on Survey & form response. Email autoresponders for Scorecard & NPS Surveys. GDPR: Anonymize results and data retention options.